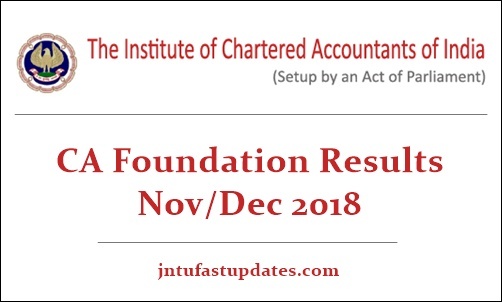 CA Foundation Result 2018 Release on 23rd January 2019: Institute of Charted Accounts of India (ICAI) is all set to announce the Charted Accountancy foundation November 2018 result on 23rd January 2019. All the hopefuls competed for the CA Foundation exams and keenly waiting for results can visit the ICAI website, icaiexam.icai.org. The result, the score can be obtained from the ICAI page. Aspirants have to enter their registration number and PIN Number to download the result. Also, ICAI will provide the results through email, SMS formats. It is possible to check the results using any of these methods. Students can check the CA foundation result 2018 name wise, number wise, centers and region wise. More details regarding the downloading process and formats are described in this article. Institute of Charted Accounts of India (ICAI) conducts the CA CPT exams in the months of November-December every year. Last year the ICAI conducted the CPT Charted Accountancy Common Proficiency Test (CA CPT) in the month of November. The test has been conducted on 11th, 13th, 15th, and 17th November 2018. CA CPT exams conducted in many examination centers across the nation. As per reports, more than 1 lakh aspirants have attended the CA Foundation examinations this year. All the hopefuls competed for the examination can check CA Foundation result 2018 Nov from the ICAI website, icaiexam.icai.org from 23rd January 2019.
icaiexam.icai.org or caresults.nic.in – Visit any of the portals. Click on the save button and download it. Take print out if required. How to Get ICAI CA CPT Result 2018 through SMS? Aspirants competed for the CA Foundation examinations in the month of November 2018 can check the merit list of top 50 candidates along with the result. Follow the process given below to Download CA CPT Foundation Merit list 2018. Visit any of the portals of ICAI. Along with the result, also merit list of top 50 candidates will be displayed on the screen. All the students who have cross-checked with the result can get their marks certificate and rank certificate. Statement of Marks can be downloaded within 4 to 5 weeks after the result has been declared. Students have to send the email to dms_examhelpline@icai.in to download the marks sheet. Rank Certificate will be issued for the students who score more than 60% of marks. The rank certificates will be issued on the all-India basis. Students who obtained top 50 ranks will be provided with the rank certificate. How to get evaluated answer books of CA CPT Foundation result 2018? Candidates can get their evaluated answer books from CA foundation from ICAI website. To get the answer books candidates need to pay a fee of Rs. 500/- per paper.